Within a matter of days after the first-ever Zing Music Awards launch, Dong Nhi is currently topping the polls for Favorite Female Artist with 51,861 votes, while Noo Phuoc Thinh is stealing the lead for Favorite Male Artist. Zing Music Awards 2010 is the first live event dedicated to honoring the talent and success of artists within the music community. In addition to the eight award categories for female, male and group artists to vote for, the audience can also initiate nominations to their liking. 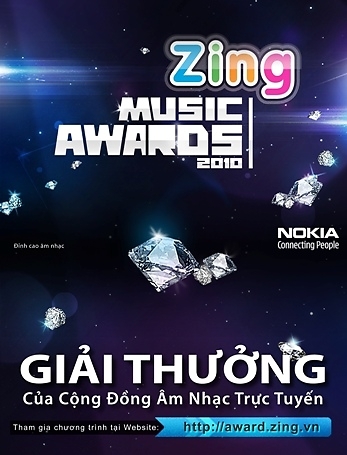 The first three categories (Top 10 Hits, Top 10 Albums, and Top 10 Video Clips for this year) will be revealed by Zing, based on the amount of votes cast through their website by its online audience, up until the closing date on December 31, 2010. Next on the ballot are the four respective male/female titles for Best Performance and Favorite Artist, which will be selected by the people via internet (http://awards.zing.vn) and mobile text messaging. Other categories also comprise of Most Improved Artist and Favorite Band of the year. Lastly, recipient of the title Artist of the Year will be determined by journalists and members from the Arts Council including: musicians Dinh Trung Can, Le Quang and Nguyen Nhat Huy; Chairman of the Vietnam Center for Protection of Music Copyright, Huynh Tiet; Director Dinh Anh Dung from the Sound and Music Recording Association; Director Doan Minh Tuan. Some notable mentions about the vote count thus far are Dam Vinh Hung with 52,299 counts under Best Performance title for the male portion, Dong Nhi with 51, 861 counts for Favorite Female Artist and Noo Phuoc Thinh with 50,591 counts for Favorite Male Artist. Names of the top 40 artists with the most votes from the nominations list will enter the next voting round. The choices will then be narrowed down to top 10 artists by December 10th. From these results, the successful recipient for each title will be named after December 31st. In order to ensure fairness, each audience member can only vote once per day for each category. There will also be IP address assessment, where the maximum number of users id cannot exceed 10 each day and the same rule also applies for mobile text messaging. Sponsors have also committed to awarding a Nokia phone to the audience member that had the closest prediction at every stage of this event. However, those who use the WAP service by Nokia will be awarded the stylish Nokia N8 as prize. wow, vietnam’s really stepping it up.